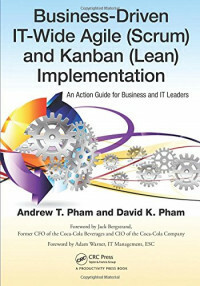 Business-Driven IT-Wide Agile (Scrum) and Kanban (Lean) Implementation: An Action Guide for Business and IT Leaders explains how to increase IT delivery capabilities through the use of Agile and Kanban. Factoring in constant change, communication, a sense of urgency, clear and measurable goals, political realities, and infrastructure needs, it covers all the ingredients required for success. Using real-world examples, this practical guide illustrates how to implement Agile and Kanban in software project management and development across the entire IT department. To make things easier for busy IT leaders and executives, the text includes two case studies along with numerous templates to facilitate understanding and kick-start implementation. Explaining how IT and business management can work together to determine business goals that drive this IT-wide undertaking, the book arms you with actionable solutions that can be put to use immediately in any IT department, regardless of size. The first edition (94301-3) was published in 1995 in TIMS and had 2264 regular US sales, 928 IC, and 679 bulk. This new edition updates the text to Mathematica 5.0 and offers a more extensive treatment of linear algebra. It has been thoroughly revised and corrected throughout.